Starting the 4th and final week of Blogging Marathon #66 with Regional recipes.For the regional theme I chose to share some of the Karnataka dishes.Today's recipe is a simple yet comforting rasam.We make rasam in a slightly different way and the rasam powder uses lot of black pepper.Also we grind the the rasma powder to a bit coarse consistency. Cook the toor dhal in a pressure cooker for 4-5 whistles with enough water.After cooking mash the dhal with 1/2 cup of water and keep it aside.f the tomatoes are not soft and mushy,pulse it in a blender and keep it aside. Heat a pan with few drops of oil and roast the coriander seeds,cumin seeds,red chilly,fenugreek seeds and dried coconut till a nice aroma comes out.Add in the curry leaves and fry it till it becomes crisp.Add in the asafoetida and put off the flame.After cooling grind it to fine powder. In a bowl take the crushed or blended tomatoes and to this add the tamarind paste,mashed toor dhal,saaru podi and salt .Then add in the some water mix it well. Add coriander leaves and green chilly,keep it on the stove top and allow it to boil.Meanwhile do the tempering with the ingredients and add it to the boiling rasam.Let it cook for a minute,add some chopped coriander leaves and put off the flame. Serve it with white rice along with some veggie fry and pappad. 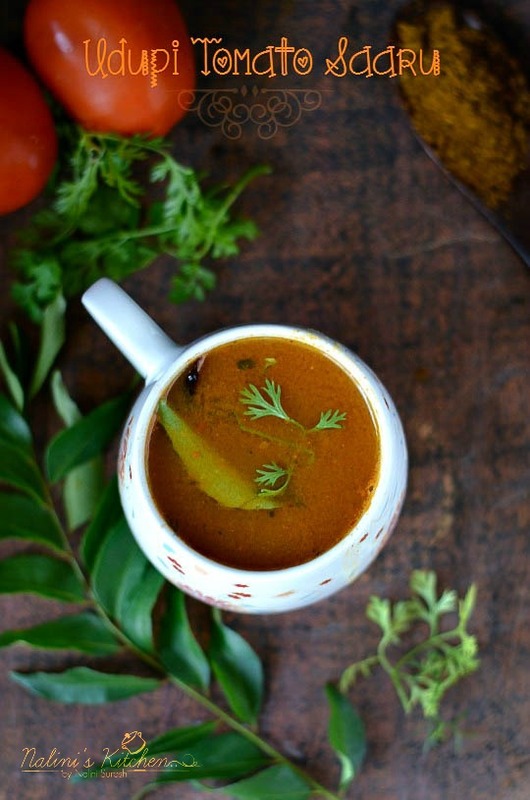 While serving the rasam mix it well and serve as it tends to settle. The saaru podi can be made in bulk and store it in an air tight container. Adding coconut gives that unique udipi flavor na.. very nice nalini. Love that black n white image. I am getting the aroma of the rasam right here ! Sounds delicious ! I loved this version of the rasam. Lovely recipe Nalini and amazing clicks! 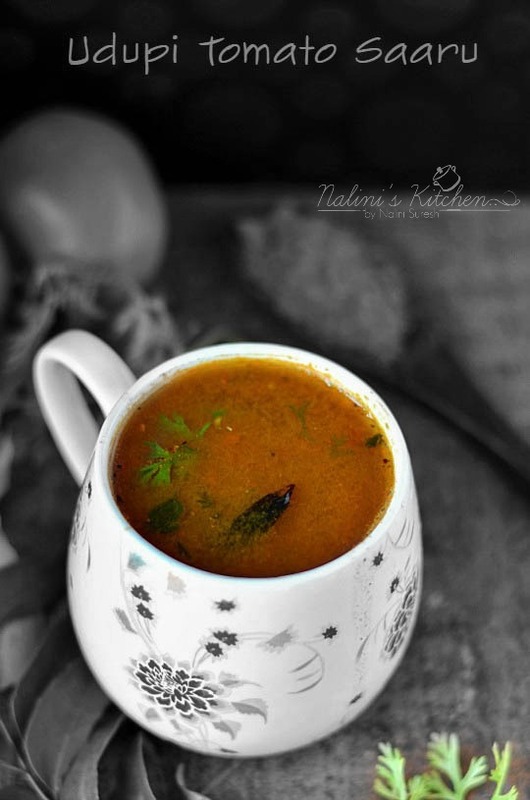 Lovely clicks of a delicious rasam Nalini. Looks super tempting. 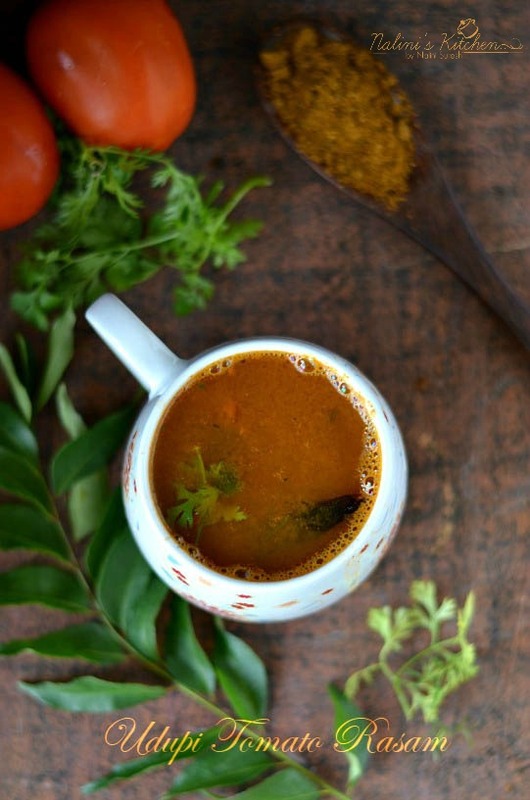 Slurp slurp, lipsmacking tomato rasam, comforting food definitely. 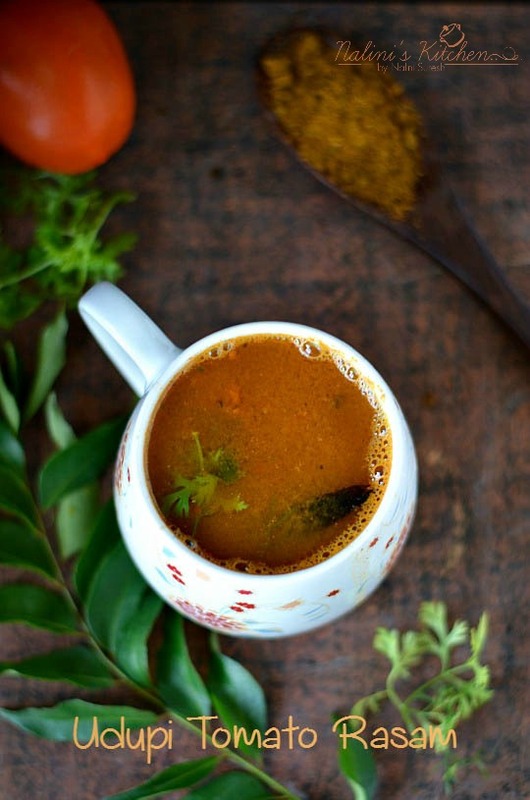 I am a sucker for rasam and this looks so good.